Great stuff: call me a mo-ron, but it took me about four cartoons to figure out who “Mo” is. I stumbled upon a brilliant page on “Creation science” the other day (http://www.teachinghearts.org/dre09creationnotes.html). It’s amazing how much effort this guy’s put in proving his specious logic. Kind of reminded me of the “atheist’s nightmare”. LOL!! Raoul, you have fallen into their trap, and have become specious, too! I’m presently in the middle of some calculations designed to determine the number of man hours consumed by scientists everywhere for all time to discover everything we know, from the beginning of history to the present time. Like I said, I haven’t completed my work, but I’m confident the number will prove to be a very large one…. Blader, LOVE your calculations! But when you finish and publish, please don’t make it as long as the aforementioned site. Wow. Now THAT’s a waste of time!! 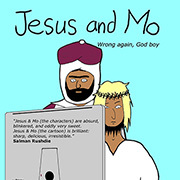 Oh, and great Jesus and Mo. Keep ’em coming. God my side hurts. As Jesus would say. I don’t know which comic I like most. Allah these are funny. As Mo etc. etc. I don’t think that bacteria becoming resistant to antibiotics is evolution. I read that bacteria have a mechanism in them that makes them able to develop a resistance to something that poisons them. When bacteria become resistant to an antibiotic, this is not a genetic change. I do believe in evolution, and I believe that bacteria evolved this mechanism. What you are talking about is the F Factor that is expressed in some bacteria allowing them to exchange genetic information with each other – such as anti-biotic resistance genes. However not all disease causing bacteria have this ability. It is a very complex mechanism but also one that takes place with little awareness of the situation the bacteria is in – it is rarely successful outside of controlled environments in the case of antibiotic resistance. The best example of small scale evolution is cancer and chemotherapy: at first chemotherapy is very effective however the cancer cells mutate rapidly and develop resistances to the chemotherapy thus the cancer becomes more aggressive and destructive over time. This is why we can’t win the war against cancer with chemotherapy. Blader… I’m pretty sure I recognise your calculations as solving simultaneous equations with two variables by calculating the values in matricies and computing a product from quadratic formula – which appears to have produced an imaginary number from a square root of a negative number. Such a calculation would contain a lot more unknown, undefined and roughly estimated variables. if human was evolved from monkey, why monkeys still exist? or its explain by SUDDEN mutation? how many animal mutants, caused by, say, radiation, live to mature and give born to next generation? I dig evolution. However, contrary to theory, evolution happens by a “lot of changes” on “short periods of time”! Modern apes (not monkeys – we’re a kind of chimp, not a monkey) have evolved from the same species of ape that we evolved from. We’d call it a man-like ape — they’d probably call it an ape-like man. To think of it another way, consider that you and your cousin both have the same grandfather. There are FAR stronger points than bacterial resistance. Hundreds of actual speciation events have been observed, from viruses through plants and insects to stickleback trout. Macroevolution of species is an observed fact, not an inference from microevolution. 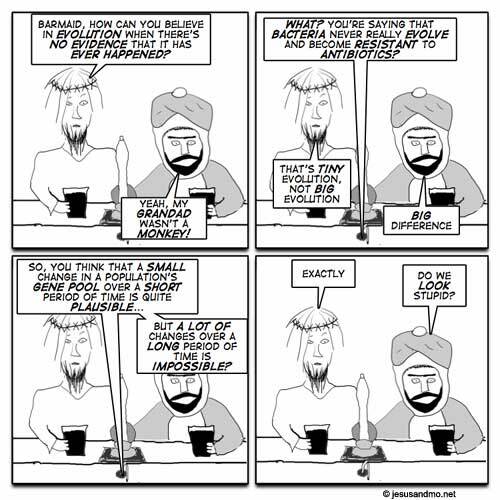 Both Jesus and Mo’s faiths evolved out of Judaism, yet Judaism still exists – and Judaism, like all religions, evolved out of some Archaïc Home sapiens smoking some good stuff while painting their cave – proof that religion in evolving itself actually supports evolution, and that it only makes sense when you’re stoned out of your tree. Nearly 6 years later and we’re still having the same discussion. Anyways, hilarious cartoon. Please don’t send me hate mail or post how I’m an idiot…. can we just, like, be cool to disagree on the religion thing since I have no problem with atheists or religious cartoons. Super.-thanks. @opinionated hijabi : No we can not be “cool”. Your utter failure to completely agree with each and every thing I say or think or do makes me want to cuddle you to death!! But srsly, ya, yer kool we’re kool, everythings kool, but hopefully not too cool cuz I don’t want another frelling ice age thanks. I hate winter enuf as it is.